It’s no secret: I’m a big fan of the Hitch. I was introduced to his writing about two years ago, when I finally removed God is Not Great: How Religion Poisons Everything off of my lovely girlfriend’s shelf (I had been staring at that yellow spine for nearly a year). Yes, many of the arguments contained within had been made before. What was impressed me most was the author’s almost freakishly entertaining prose. This man could probably write a page turner on competitive grass growing. That it was on the best subject of all, religion, was icing on the cake. Since then, I’ve been committed to reading everything under his byline. So it was by happy chance that when a few months back I decided I wanted to do several portrait paintings, Hitch came to mind. He is a rather imposing looking fellow, English-frump with Scotch-neck (see Ted Kennedy). 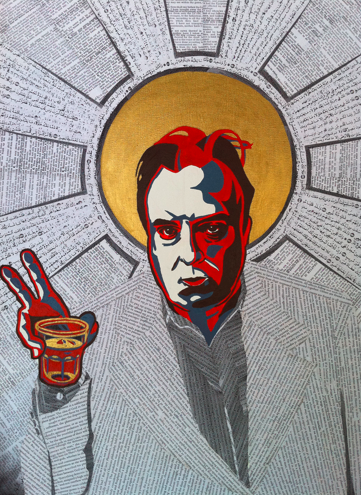 But now that it’s finished, I think I’m going to move on to painting several other authors, and to my friends I promise to “tone it down” a bit on Hitchens. Get better soon Hitch!